Realism is defined as art that convinces the viewer that the described visible subject exists outside the art itself. Successful illusionistic and highly descriptive representation that is closely aligned to what the eye sees with little interpretation or manipulation of the visible facts is the sole criteria for selection in this latest straight up call for realism at Manifest Gallery. The 25 chosen works represent several subcategories within this genre including photorealism, hyper-realism and various nuanced versions of the trend. Works both local and international include paintings, drawings, photography and one sculpture. Some works present a selected item for viewer inspection while other works portray an encounter or dramatized incident. 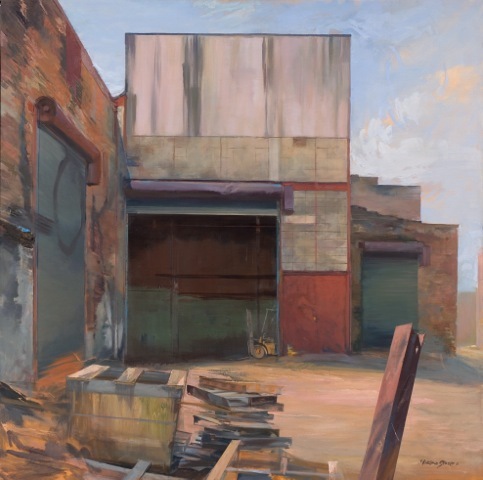 “Jeffrey’s Table” is Eberhardt’s depiction of the solidly realized table with a painterly white brick wall background. The tangible brick facade behind the table uses every color except white.The entire work is enjoyable for its chunky brushwork and unapologetic verve. Realistically portrayed in all aspects for viewer inspection is “Razer” by Cannings. In this very believable painting, the artist toys with the fantasy and thrill of destruction associated with a child’s plastic space gun. Its formal qualities of patterned hand grip and red shiny plastic are visually celebrated in a seamless painting technique. The toy’s cast shadow, vaguely resembling the lower continental United States, glows menacingly with the transmitted light from the translucent red plastic, a possible allusion to a future of destruction. Mark Hanavan’s “Surface” places the viewer virtually nose to nose with the visage of a realistically portrayed severed head. The likeness hovers larger than life in the recesses of a black abyss. The unforgivingly observed landscape of the face and briar patches of hair of the individual are summoned to light with charcoal, oil stick and gouache, the sculptural aspect of which enhances the effect of illusion. In David Dorsey’s “Skull Unearthed circa 1930”, the shipping box, scribble-marked “actual human skull”, presents the decapitated human remain in the eerily incongruous setting of a breezy open spring window. Study the sockets and cavities of the sculpted toothless mandible as the artist did in an intricately painted, multiple ridged landscape. One soon forgets the morbidity and is engrossed in the painter’s facilitation and fascination with his subject. Photo-realism is represented by several pieces including the work: “Transit 1” by Ann Pegelow Kaplan. This 4’x4′ aluminum mounted photograph depicts a non-incident moment of contemporary co-travel in the close environs of public transportation. Each individual is further secluded in their unique bubble worlds of ear-plugged internal concern or electronic faux-connectivity. The dimensions of this larger work invites the viewer to relish the fluid but separate spacial settings that characterize this common contemporary experience. Two nightcaps and two cigarettes, a shadowy figure putting on hat and coat in the recesses, are all elements of film noir in a piece easily dismissed as photography on first glance. The drop-dead faraway look in the eye of the scantily clothed young woman as she reaches for the concealed weapon, is the riveting fixation of a deadly narrative in dramatically composed tones. Joseph Crone’s “Salut” is a visual whodunnit about to be committed. Who would have guessed it is executed in color pencil on frosted acetate? This piece, featuring a very descriptive narrative and detailed setting, defies the viewer’s attempts to ascertain the material or the artist’s touch on the surface. Elise Schweitzer’s large, twin canvas painting, “Skydiver’s Landing”, portrays the dramatic recovery efforts of several casual rescuers in the backyard demise of a parachutist. Urgent, open brushwork and minimal detailing feels like the painting was made in the moment on the scene. Edges are ‘found’ only when necessary, details dismissed. Color notes move the eye through essential passages. Yet through a gestural network of unmolested strokes, the artist succeeds in capturing the tragic narrative and airy light of a bright summer’s day. “Fifth Element” by Jose Sanchez of Columbia, S.A. and “Distressed Beauty” by Douglas Norman are accomplished tromp l’loeil works. The two tableaux in oil are an assembly of minutely described natural elements and accented with bold color block. Seamlessly painted, the elements of natural form are displayed on the traditional, spacially protruding shelf and pay homage to the beauty and design quality of nature. Shamback’s “Mandeville Hybrid with yellow lilies” is an oil painting on copper. Writhing like a roller coaster, the winding red vines with multiple natural floral heads, roam over the painted surface. The loosely painted background and ragged edges reveal the copper substrate and remind the viewer throughout of the painted illusion. Constructed and reconstructed of several different plants, this work professes realism in its end result. Though it is an illusion sifted out of many experiences, it succeeds in convincing the viewer of the reality of its existence outside of the art itself. 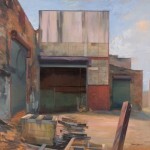 Regardless of medium utilized, this exhibit is an excellent survey of the various trends and nuances of Realism’s Realism. Thank you for your wonderfully written review of Manifest’s HIGH on AEQAI! I particularly enjoyed the way you described my painting in the show. I was a bit self-conscious about how “open” it was compared to the more highly finished works in the show, but your response to it was incredibly heartening and encouraging.